There are many sitting pillows available to purchase. But sadly, all are not made equal. In addition to quality, the one that’s right for you is dependent on various aspects, the most important being the reason why you want or need it. Sitting pillows are ideal for anyone confined to bed rest, making sitting up comfortable and effortless. They can also help ease the symptoms of certain medical conditions, such as heart failure, acid reflux, or those with back and/or spinal pain. In addition, they can also be a great comfort aid throughout the later stages of pregnancy. Providing excellent value for money, the Brentwood Originals Brushed Twill Bed Rest Pillow comes in a great range of colors. The pillow supports your back and head, and has well placed armrests for additional comfort. It comes with an integral carry handle that makes it easy to move from place to place. When it comes to quality, whilst this is the value sitting pillow on the list, it deserves its place and can hold its head high amongst its more costlier cousins. Polyester fiber fill covered with durable polyester brushed twill fabric makes for good support and comfort. The Bedlounge Hypoallergenic: The Ultimate Back Wedge is a top class sitting pillow. From its ergonomic and aesthetically pleasing design to the superior comfort it offers, this is the king of kings when it comes to supporting the neck and the back. The Back Wedge has been designed by world-renowned back and neck expert, Dr. Robert Swezey M.D. A clever internal frame covered in layers of down, fiber, and foam means it conforms to your every movement and distributes your weight evenly. It boasts a lumbar area made from soft down and the headrest rotates and slides upwards and downwards. The armrests also pivot. All this means the cushion can be customized to fit you perfectly. Specifically designed for those with breathing problems, poor circulation, hiatus hernia, and/or back and neck issues, the Jobri Spine Reliever Bed Wedge is perfect for anyone who wants a sitting pillow that provides a slightly firmer support. It has a layer of memory foam, meaning that it perfectly contours to the body to provide an optimum level of comfort and support. It boasts an adjustable neck roll and the pillow can be set at two different angles: 30 degrees for watching the TV and 60 degrees for sitting in a more upright position for reading or working on a laptop. 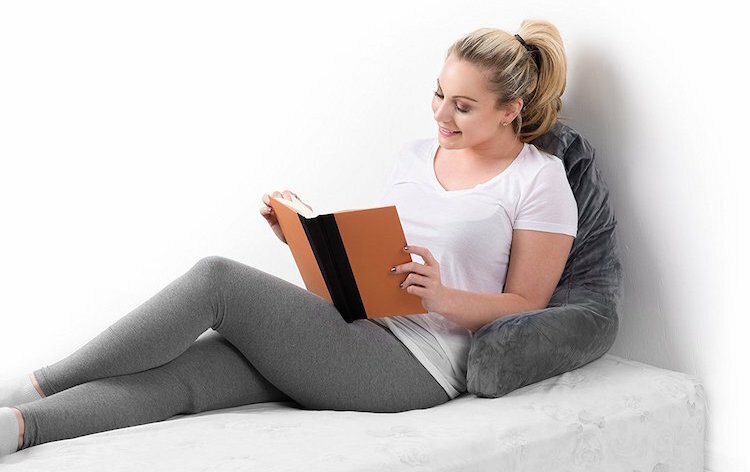 With its plush velour cover, the Linenspa Shredded Foam Reading Pillow offers both comfort and great value for money. The pillow is filled with clusters of foam that provide softness with support to the back and neck. Thanks to the clever method of shredding the foam contained within it, the pillow can be plumped and patted for a fully customizable fit. It also provides excellent airflow, meaning the cushion doesn’t get too hot. It has an integral carry handle making it easy to move from place to place, and the cover is a neutral stone color, so it will match any kind of décor. The Comfysure Reading Pillow: Orthopedic Support Chair Pillow combines premium quality with value. And the end result is a super sitting pillow that provides great support for your neck, back, and arms. Covered in soft, grey velour, the filling is shredded foam that molds to fit your individual body shape. The cover is easy to keep clean as you can spot clean with a damp cloth and detergent. Both the cover and the filling are 100% polyester. The shredded foam filling allows for good airflow, meaning you don’t get too hot whilst using it. Lightweight with an integral carry handle, making it easy to move from place to place. The neutral color will fit in with most decors. How to make your bed into an armchair! The Nap Bed Rest provides premium support whilst sitting up in bed. Covered with ultra soft fabric, this makes sitting up in bed a pure luxury. This clever pillow can be folded up and stored beneath the bed when not in use. And it has longer armrests and a higher back than most of the similar products on the market. This makes it a great choice for the taller or larger build. The filling is soft, comfortable foam that provides great support for the back, neck, and arms. It has a built in cup holder and side pocket to keep all your essentials at hand. Can be spot washed to keep clean.